Back in July 2009 Apple suddenly removed all apps from the App Store that related to Google Voice, Googles phone service that allows for voice mail, texting, calls and more. There was no explanation as to why this move had been made, and most people just chalked it up to the ongoing fight between the two companies. Apple wasn’t commening on the situation, so everyone was in the dark, and we just kind of went on with our lives. Flash forward to this weekend, and two Google Voice apps appear again in the App store. And just like when they disappeared, we have no idea why. 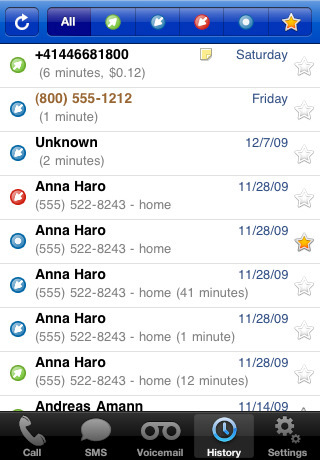 GV Connect was the first to appear, followed closely by GV Mobile +, one of the popular apps from the days when the service was still in the store. Both apps sell for $2.99, and both are getting decent reviews from those that have already purchased them. It appears these may be a result of the recently retooled developer agreement, but as everyone is staying quiet on what is happening who knows. Honestly, I think after all the problems Apple had with the government last time after pulling these apps, I highly doubt they’re going to be quite as seemingly random with their deletions. There’s nothing set in stone of course, but I think you’re pretty safe getting used to these apps being with us for some time. What say you? Are you happy to see the return of Google Voice?